Mama first heard about the launch of Happy Tails, the second pet insurance in Singapore, back in October. Its coverage sounds more promising, but it also has stricter terms compared to Singapore’s very first pet insurance – PetCare by Liberty Insurance. 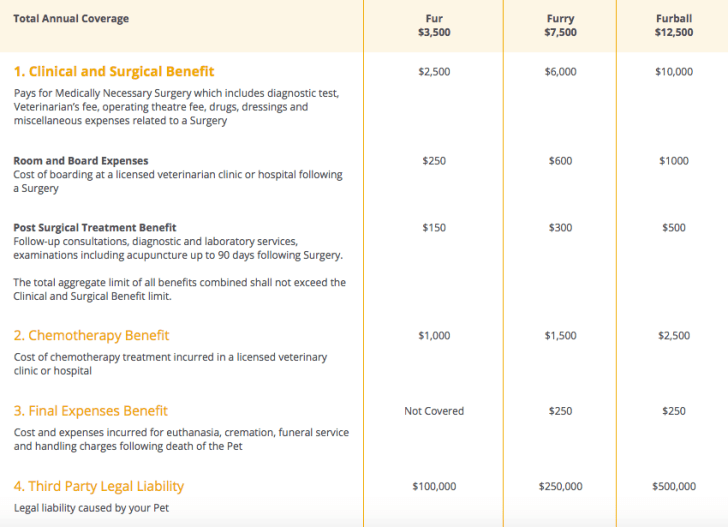 Just by comparing the FUR plan with Liberty Insurance PetCare’s cheapest plan (both have similar premiums based on the above-mentioned particulars), the FUR plan has better benefits in terms of surgical treatment and follow-up. In instances of certain conditions or adverse claims, the premium may be increased to reflect the risk incidence to the overall premium pool. It is mandatory that the pet undergoes a clinical examination for enrollment within 30 days of the commencement date of the insurance. You must produce the report when making a claim for the first time. You can download the clinical examination form here. PetCare by Liberty Insurance does not require a medical examination. For pets that are not spayed or neutered, there is no coverage for illness related to prostate problems, hormonal skin conditions, perianal hernias, testicular tumours, perianal tumours, mammary tumours, uterine and ovarian conditions. Your pet has to be above 16 weeks and below nine years old at the commencement of this insurance. You must microchip your pet and license her with Agri-food and Veterinary Authority in Singapore. She only needs to receive all required puppy vaccinations. Your pet cannot be a working pet. E.g. not for the purpose of racing, breeding, law enforcement, guarding, or for other commercial use. Exclusive for Vanillapup readers, enjoy 10% savings when you enroll with this discount code: VP10.